USGS is busy quelling rumours over residents concerns regarding the stability of Mauna Loa, a second volcanic peak on Hawaii Island. Concerns over the stability of Mauna Loa have spread like wildfire on social media sites claiming an eruption is imminent, however, USGS has said Mauna Loa is not erupting and there is no evidence it is about to erupt. According to Hawaii News Now, the new lava delta formed has grown to 200 acres and continues to expand while lava pours into the ocean at two different points. The lava reaching the ocean is all from fissure 8, which remained active overnight, into Saturday morning, scientists said. Lava gushed 130-160 feet in the air with occasionally higher bursts, USGS officials said. 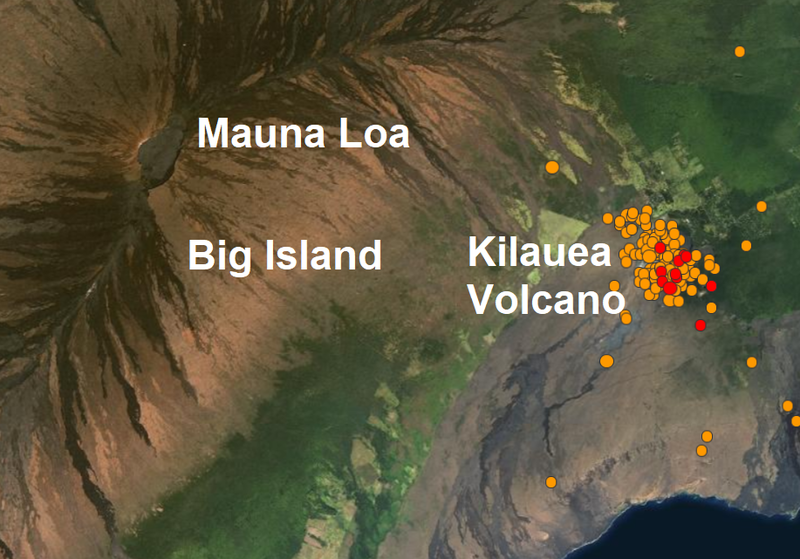 A mag 5.2 quake struck the Kilauea summit early Saturday morning and more than 150 smaller quakes struck the area yesterday as seismic activity is still producing more than 100 quakes a day, see photo above. Hawaiian Volcano Observatory officials reported another explosive eruption at Kilauea's summit. Based on available indicators, the ash plume swelled to 10,000 feet in the air. Cracking and slumping of the Halemaumau crater walls are clearly evident in aerial views, USGS said. Steam plumes have been rising from within the crater, as well as from cracks adjacent to the crater — which are more signs of ongoing seismic activity.